The module "calculation of quantities" makes a quick acquisition of surfaces, lines and punctate objects off the CAD possible, also the transformation in accounting objects/material allocations and their connection to the bill of quantities with automatic quantity control is possible. An import interface GAEB DA81-86 is available. One or multiple positions can be assigned to every object and vice versa a position can naturally comprise diverse surfaces. A quick import of site measurements is integrated, too. The replication with the employer occurs as a difference data file REB DA11. 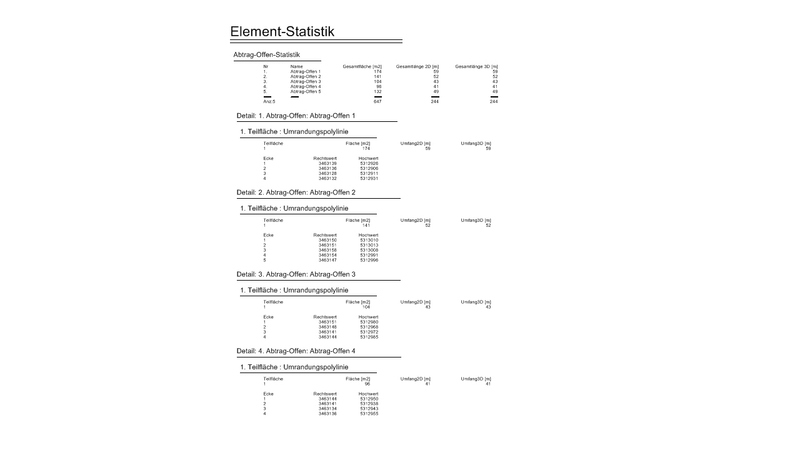 The calculated CAD-elements can be selected with the help of different filter functions (e.g. after surfaces, polylines, points and layers) or via selection and they can be converted to accounting objects in one operation. These could be for example: pavement surfaces, topsoil filling, kerbs, gutters in running meters, trees or bollards as simple elements. In the same operation an AVA-file (e.g. DA81) is imported. An editor indicates for you all objects, classified according to type or unit, as well as the bill of quantities with the positions. The positions can be ordered too (according to different criteria), to facilitate the assignment. The assignment takes place via "drag and drop" in the bill of quantities-editor. 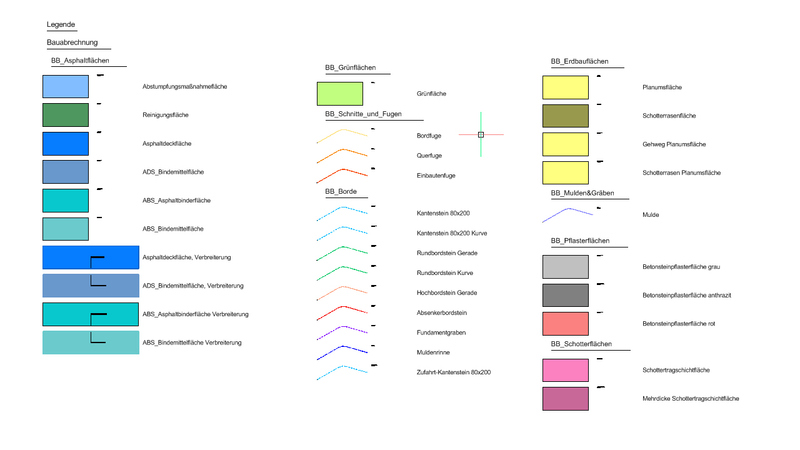 The processed CAD-elements will be marked in color after the occured assignment, similarly to the positions, which already have an assigned CAD-element. This increases the clarity and avoids mistakes. Different formulas of the REB 23.003 can be assigned to simple objects for the general calculation of quantities. Also solid calculations are possible at the surfaces (across a definition of layer thickness). It is made possible for the user to compile an extensive list or library of signatures or rather accounting types (asphalt, pavement, grass seeding and topsoil filling) for the simultaneously and high-quality plan design of accounting plans. A base library will be included, whose entries can be copied as samples. Display settings are not only color, types, widths and angles of hatch pattern- and border polylines. 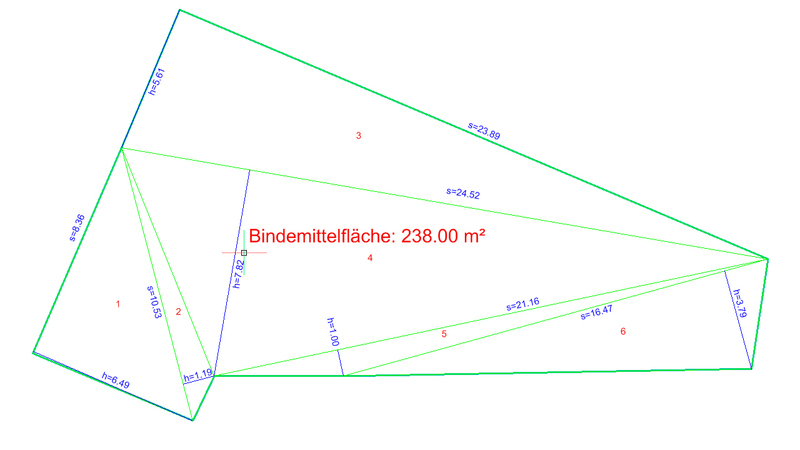 Further important display settings are: the automatic inscription of name, of 2D/3D-surfaces, of 2D/3D-lenghts and of segment dimensioning, the calculation and inscription of the barycentres and the coordinates with or without z-component and their distances. The measured surfaces get a surface name and are automatically counted up. The accounting objects become CivilDesign®-elements, which can be individually changed at all times with the [edit element]-command (assign to another accounting type and change the name). The position of the text of the surface inscription is stored and can be changed via CAD. 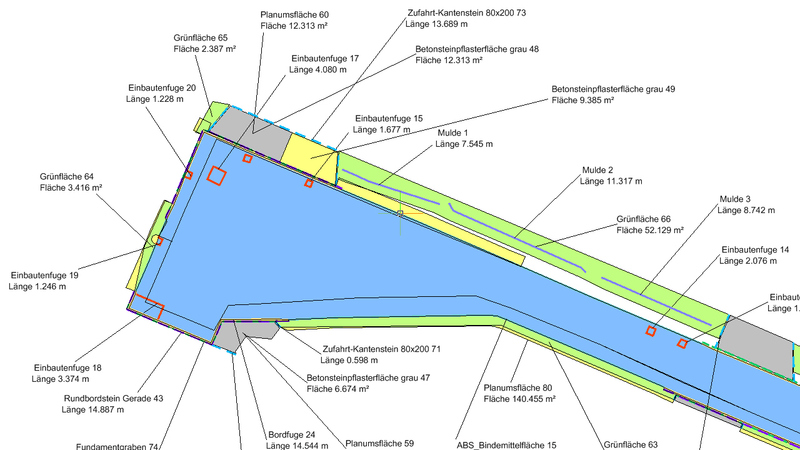 A map frame-function compiles high-quality layouts in the CAD under consideration of the in-house title block, of individual north arrows and of the optional generation of coordinate planes with adequate inscription.